The eastern subterranean termite is a beneficial insect in forested areas, where it feeds upon dead trees and vegetation reducing these 'ecological wastes' into organic material. However, termites also cause millions of dollars in damage to homes each year, making termites the number one enemy of your home. Termite damage to homes far exceeds damage caused by fires, floods and storms combined each year. If you suspect you have termites in your home, a pest management professional should probably be consulted. About 1/8 of an inch in length, with a milky, yellowish-white appearance. Process cellulose via protozoan bacteria in their gut. A typical mature colony may number 60,000 to over a million workers. Sixty thousand workers can consume 2 1/3 linear feet of pine 2x4 board in one year. Their only purpose is to defend the colony. They have large, pincer-like mandibles. Their length is about 1.5 times their width. Swarms occur in the spring and early summer. They are about 3/8 of an inch in length, including wings. Their bodies are dark brown to almost black. A chemical barrier should be placed between the termite colony and the structure. All wood, rigid foam and form board to soil contact should be eliminated. Wood debris must be removed from crawlspaces and moisture content structural wood should be below 20 percent. Moisture management within and around a structure helps reduce termite activity. Direct treatment of termite galleries in wood will maximize treatment effectiveness. 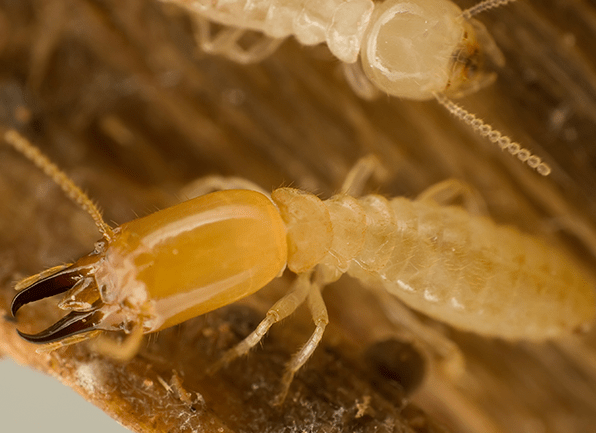 Visit our Termite Resource Center for more information about these wood-destroying pests. Spring is here - is your Indianapolis home protected against termites?